Few of us like changes in our lifestyles. We simply don't like being rooted out of our old ways of doing things. We tend to obey the law of inertia. Inertia is any object's resistance to a change in its state of motion or rest, or the tendency of an object to resist any change in its motion. Our Lord Jesus knows us well, and knows the effects of Original Sin in our human nature. We resist changing. We desire to remain undisturbed, comfortably doing what we've been doing. "And no one who has been drinking old wine desires new, for he says, 'The old is good.'" Our Lord Jesus addresses this sinful law of inertia by a parable about wineskins. 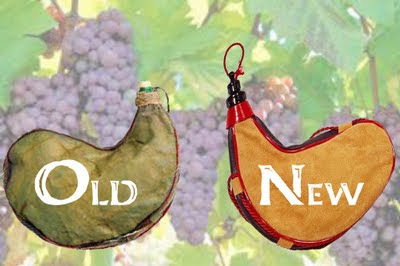 He tells us that we cannot put new wine into old wineskins because –- while the new wine continues to ferment (to change) and to produce fermentation gases inside the old wineskins –- the old wineskins will burst, because they are unable to expand. So, He concludes, "... new wine must be poured into fresh wineskins." The Lord Jesus' lesson for us, is that we must maintain a spiritual flexibility and elasticity in our lives, and be open to growth. We must be willing and able to expand. We've got to fight that sinful law of inertia within us. Change demands adjustment, and this can be difficult, uncomfortable, and demanding. Life is full of growing pains, yet we must go through them in order to reach maturity. We really mature when we arrive at knowing ourselves in the manner in which God knows us. The Holy Eucharist is the Sacrament of change, of transformation. The main purpose of the Eucharist is to transform us into Christlike, Godlike people. If we are receiving the Eucharist worthily and regularly, the Body and Blood of Christ we receive will lead us to act, think, feel, perceive, and speak more and more like Our Lord Jesus, because it is He who is in the Holy Communion we partake of. God wills that we should change ourselves for the better -- that is, to become more and more like His Son, Our Lord Jesus. And, so, you and I must learn to be supple vessels in His Hands. We've got to be prepared to undergo purifications of our soul –- purifications that may be painful. These are necessary labor pains before giving birth to the new man- or woman-in-Christ that God wants us to be. This is why Catholics must disobey the sinful law of inertia. Instead, we must maintain a flexibility and elasticity in our lives, and be open to growth, revision, and adaptation. Because, to grow means to change. And to reach perfection in Christ Jesus -- to which He calls us -- means we will have changed many times.